Walls of Ash Trade Paperback Now Available! The print version of Walls of Ash is now available through Createspace and will be available on Amazon.com and BarnesandNoble.com within the week! The print version is set at $13.99, the eBook is available for $2.99. ‘Walls of Ash’ is Now Available! I spent all day yesterday uploading and formatting and altering things so that ‘Walls of Ash’ would be available to the public as an eBook. Well, I am pleased to tell you that you can now own your very own e-copy of ‘Walls of Ash’ from Amazon.com, Scribd.com and Smashwords.com for $2.99. Details on print copies will be available soon and you can bet I’ll post an update everywhere under the sun when they are! If you are interested in owning a copy, simply choose the buying method you prefer from the right by clicking on the button to each website. I want to say ‘thank you’ to so many people, but I feel like it lessens the joy of seeing your name in the acknowledgements if I go blabbing it everywhere else, you know who you are. Thank you for everything. And to those who plan to begin reading this work, thank you, too! Walls of Ash Cover Art! I am pleased to announce to you all that the Walls of Ash cover art is officially complete. First, I’d like to say a big ‘thank you’ to Erica Wilson, who took the time out of her busy mom-schedule to do this for me, she is amazing! This cover was meant to be a sort of homage to the very popular Gothic Romance covers of the 1970’s but with a modern twist. As many of my friends and family know, I am obsessed with Eleanor Hibbert who wrote under many pseudonyms, but specifically her Victoria Holt books had covers that often featured a large, dark house with a gloomy atmosphere and a young woman nearby. Erica did a great job of capturing this in a modern form. I’m looking forward to releasing the book to you, hopefully mid to late December. I’ll keep sending out updates as I have them to offer to you. In the mean time, enjoy this piece, Erica worked hard on it and her cover art came out fantastic! In a time when young ladies were bred to wed and follow orders, Tamsin Rhineholt is an unconventional and stubborn daughter of the house, Rhineholt. With a mystery surrounding the loss of her parents, she still feels her mother’s presence in her life. When Tamsin is threatened if she refuses an offered hand in marriage, she realizes that her mother is trying to warn her of the terrible things to come through her dreams. Her dearest friends try to help her in the most trying of tragedies, but there is a fine line between faith and madness. Can great distance dissolve the fear that pursues her, or will that fear follow Tamsin to her end? Does love truly overcome all obstacles? 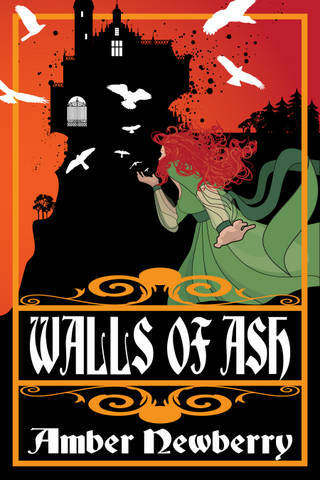 Walls of Ash is Amber Newberry’s first historical gothic novel and the beginning of a series that will follow the daughter of each book’s previous heroine. Walls of Ash is in the final stages of preparation for publishing and is slated for the end of 2012, details coming soon. The second of the series, The Masque and the Mausoleum is in the writing stage and will be released in 2013.